When planning a start-up business, you are bombarded with exciting ideas in your head and often times make peace with them before they even come to life. New ideas are great, however, new businesses are prone to failure, and most new ideas take time to catch on. Franchising allows you to plug into a proven, successful idea and operating system, and focus your efforts on running the business, rather than on adjusting it in midstream. The wheel's been invented, perfected, branded, and marketed. · A fast-growing spa concept awarded by Top Brands Award as “Most Outstanding Lifestyle Nail Spa Specialty Salon” in just less than a year of being in the business. · Awarded as "The Most Outstanding Nail Salon for 2012 " by Seal of Excellence / People's Choice Awards. · Promotes a high set of standards in our products, services and our business operations. · Aid in location analysis and site selection, as well as site design and layout. · Full initial and on going support and training on spa operations, services, and protocols. · Multiple product lines to generate revenue. · We pride in discovering innovative treatments and services to continuously provide our clients new, healthier and valuable spa services. · Strong social media outlets to reach out to current and new clients. A team and advisory board with strong expertise, experience and passion in the business. 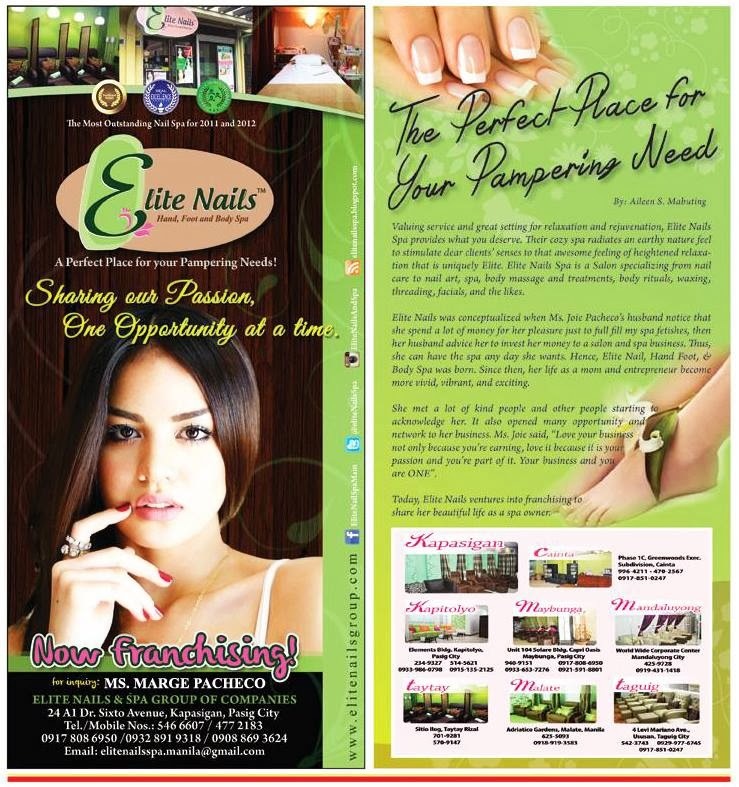 You’re on the right track with Elite Nails Spa. You can consider this offer as one-of-a-kind business opportunity to start ahead and become an eligible partner to join us in our success.